If you ask the people of Jefferson City what they love most, the answer would be hockey. With the only rink in a 120 mile radius, the town and its kids are pretty much addicted to the sport. It was a devastating blow when this past year their rink was flooded not once, but twice between August and September. It's a really big blow to the community, especially because there just isn't another rink they can go to. News outlets all over the state covered the story, with community members coming together to try and get the rink open. In a recent article, Chris Wilson, the Jefferson City Convention and Visitors Bureau's sports and film sales manager, surveyed the damage around the ice arena, then told the News Tribune: "It's disheartening....people were excited about having the ice time and skating season and the hockey season and the different shows." Still, he said, "We'll rally together as a community and get it cleaned up, get the ice back down and get the support that Parks and Recreation and the support groups need. "We'll get back up on our feet and move as a community — that's what we do." The floods also posed a problem to their under-resourced players. With most of the funds going to fix the rink, there was little left to provide equipment to players who otherwise wouldn't have the means. The team has already been delayed six weeks due to the floods, and the town is in the process of rebuilding itself. 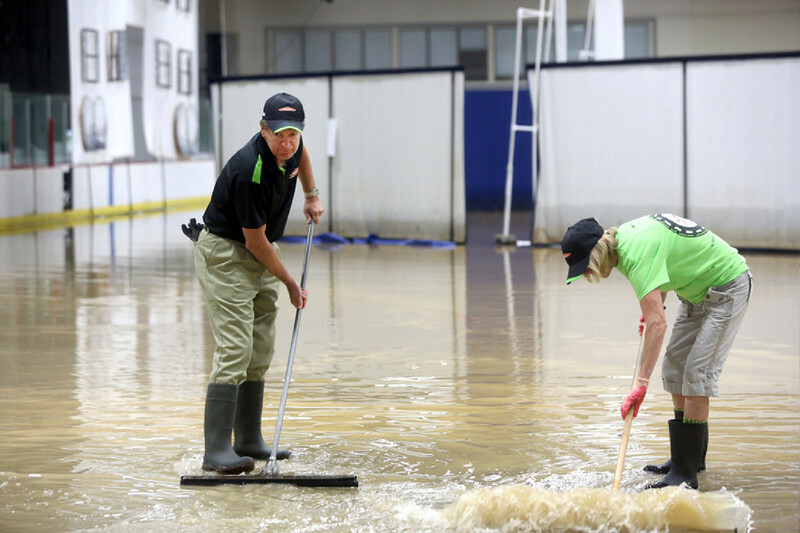 "Obviously we had to cancel the first set of lessons... all the hockey teams have lost practice and figure skaters were scheduled to go into regional competition and they haven't been able to practice," Stiles said. "Our synchronized skating team is actually driving to St. Louis and renting ice there so they can get ice time so it's been a huge impact on the groups", said Phil Stiles, the Division Director of Jefferson City Parks. But the players are resilient, and once the rink is back open, they'll be right back out there. The Missouri Tigers are the recipents of the $1000 Get In The Game Grant from FlipGive and Hockeyshot.com. With these funds, ALL of their players will be able to get back on the ice this season, way to go boys! To find out more about the Get In The Game Grant or to make a donation, click the link below.